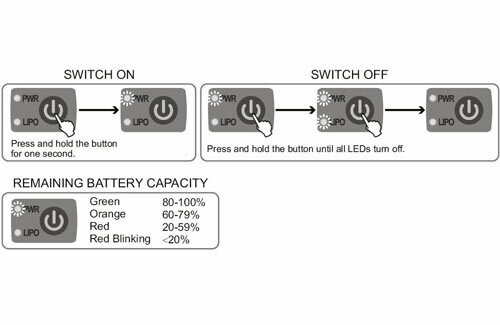 A clever device that combines the function of battery voltage regulator for using 2 cell Li-Po batteries as the R/C power source with a glow driver function. 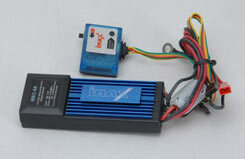 Also incorporates a handy voltage checker light system for monitoring the battery state. 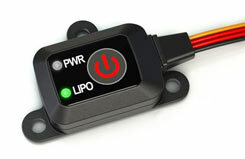 A great way to fly your IC helicopter using Li-Po R/C power and no need for a glow energising system to start. Just press the ignition/start button when you are ready to start and you're ready to spin the engine up!Output voltage for R/C � 5.0VMax continuous current for R/C � 6AGlow output voltage � 1. SKYRC introduces the POWER SWITCH, a tiny MCU controlled on/off switch. A simple push button operates the switch, eliminating the problems associated with the contacts in a traditional mechanical switch. The plastic sealed unit can easily be mounted to your model with screws or double side tape (two kinds of bottom covers are included). The switch also features a LiPo mode, by turning this on the switch unit will auto detect low LiPo voltage and cut off power to protect your LiPo from over dis-charging (can be turned off). 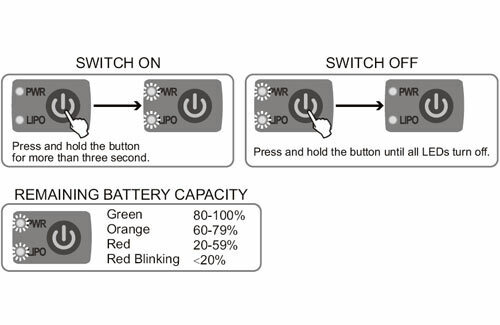 To top it off this power switch can inform you about the remaining capacity and conditions of your battery pack!